Great Lakes Books Series, 9780814332924, 470pp. As volunteer engineers for the Union army, the First Michigan Engineers and Mechanics regiment was made up of skilled artisans, craftsmen, railroad men, and engineers whose behind-the-scenes work was crucial to the Union victory. Charged with maintaining the Union supply line in the western theater, the engineers constructed and repaired a staggering number of bridges, blockhouses, fortifications, railroads, and telegraph lines to keep the Union army functioning in the aftermath of battle. "My Brave Mechanics" traces the history of this little-known unit, revealing their substantial engineering accomplishments as well as their combat experience. Although they were charged primarily with engineering work, the regiment also saw substantial direct combat action. Confederate guerillas and bushwackers bent on disrupting vital communication and supply lines routinely disregarded the usual rules of warfare to target the engineers. They struck quickly, and sometimes at night, exploiting the isolation and vulnerability of the workmen, who, unlike regular infantrymen, were almost never dug-in and ready for an attack. Yet despite the odds against them, the Michigan engineers are recognized for several key accomplishments, including their work in keeping the railroad open south from Union supply depots in Louisville, the relief of the Union forces in Chattanooga, and destruction of rebel railroads during Sherman's march through Georgia and the Carolinas. The regiment's senior officers also held important posts within the Union military organization in the west and were instrumental in developing a coherent policy for the use of captured rebel railroads and infrastructure. 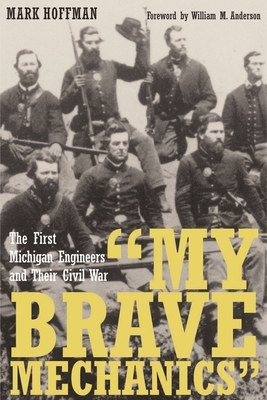 Historian Mark Hoffman offers readers a detailed account of the Michigan engineers from a wealth of sources, including letters, diaries, regimental papers, communications and orders from the military establishment, period newspapers, and postwar accounts. As little has been written about Union volunteer engineers in the western theater, their unique history will undoubtedly be fascinating reading for Civil War buffs, local historians, and those interested in the history of American military engineering. Mark Hoffman is deputy department director of the Michigan Department of History, Arts and Libraries.